This two day training is open to schools and agency staff that serve parents and students in grades 6th-9th grade. College Knowledge Academy (CKA)- College Smarts, is a five week project based program, for parents and their children, that promotes early planning and knowledge about postsecondary options. College Knowledge Academy (CKA)- College Smarts, is a five week project based program, for parents and their children, that promotes early planning and knowledge about postsecondary options. 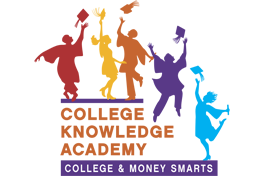 The College Smarts program provides interactive lessons focused on building parent/child communication, the importance of high school completion, higher education, financial aid and college preparation. At this two day facilitator training, school and agency staff will receive materials and professional development to strengthen parent engagement and support a college going culture. * All FIS trainings are a compliant use of Title I funds allocated for professional development and parental involvement, as well as other state or federal funds reserved for school improvement and/or parental involvement, including California’s LCFF funding. For more information, please contact Lupe Miranda at gmiranda@familiesinschools.org or (213) 201-3905. Click here learn about our curricula and professional development trainings.